Boyds Mills Press, 9781590789353, 192pp. Lola Zuckerman is always last—ding-dong, Z-for-Zuckerman last. What this means, of course, is that Lola has to win first place in her class's "Going Green" contest. And she'll need to beat Amanda Anderson—always first, and more importantly, her ex-best-friend! In this laugh-out-loud story with unforgettable characters—the first in an ongoing series about Lola's travails—Lola's out to prove that while she may be last, she is certainly not least! Christine Pakkala grew up in Idaho and studied English and Journalism at the University of Idaho before heading east to attend the Iowa Writers Workshop (MFA, Poetry Writing, 1993). She was a Fulbright Scholar in 1994 in Helsinki, Finland, where she translated modern Finnish poetry. She has taught seventh and ninth grade English at Horace Mann. 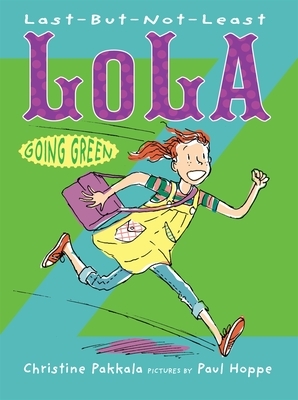 Last-But-Not-Least-Lola: Going Green is Christine's debut middle-grade novel. She lives in Westport, CT.
Paul Hoppe is a New York-based illustrator, designer, and author who enjoys venturing into a variety of fields. He works in Editorial Illustration, Children's Books, Comics, Advertising, Graphic Design, and in the summers he teaches at the School of Visual Arts. He is the author-illustrator of two picture books and the illustrator for several other picture books and young adult books. His work regularly appears in the New York Times and the New Yorker. Born in Poland and raised in Germany, he lives in Brooklyn, NY.